Halloumi, what can I say? I love Halloumi! (Let’s just park my dairy ailment for the sake of this post – no I am not eating this. Most sadly.) 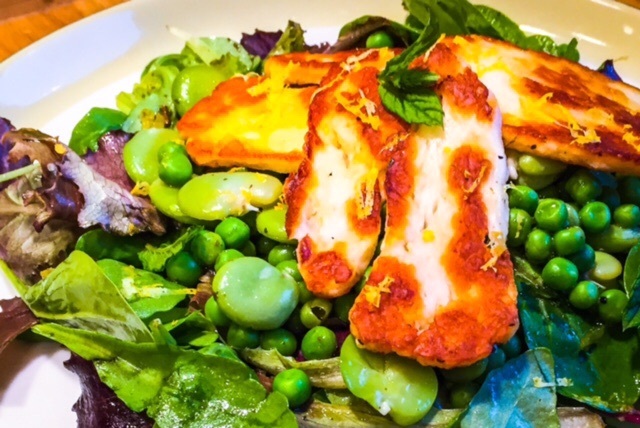 The very first time I tried Halloumi I was hooked. This is an amazing cheese. It is what I see as perfection between feta and mozzarella. Preparation, most definitely requires sneaking the irregular pieces which just don’t have the esthetics for cooking. And then once cooked, all those pieces which split….maybe some of them should be taste tested to make sure they are still okay. Is this just me? Well this salad was born out of an abundant supply of broad beans in our organic delivery box, a few years ago. Now my previous exposure to broad beans has not been all that favourable. But, as I was now very aware, most of my favourite vegetables resulted from foods I detested when younger, I had faith there might be hope around the corner for the humble broad bean! My first obstacle was the tough outer shell. Blanching soon solved that problem. Since this time, two of my favourite chefs, Yotam Ottolenghi and Sami Tamimi, have come onto the scene with their amazing cookbook Jerusalem. And now the use of broad beans would be easily solved with the likes of Broad Bean Kuku or Meatballs with Broad Beans. However, I had no such inspiration beforehand. I have adapted this recipe from the Guardian by Kate Carter. It more than served its purpose and we made it every time we came across a delivery of broad beans. And again when we would seek them out specifically for this recipe! Here it is for you. Blanche the broad beans in boiling water. Drain and then remove the outer skins. Cook the peas, drain and set aside. Slice the halloumi and fry this with a little olive oil. Then cut each slice into bite-sized pieces. Add this to a bowl along with the beans, peas, mint and salad leaves. For the dressing, mix together the olive oil with the zest and juice from the lemon and pour this over the salad. Toss and serve.